This timeless classic by Harold J. Laski explains the nature of the modern state by examining its characteristics, as revealed by its history. The State in Theory and Practice is a work that grows in significance, rather than dwindles over time. This is because, as Sidney A. Pearson, Jr. points out, Laski helped develop and expound the foundational arguments of the political left.After the collapse of the Soviet Union, even on the hard left, few people thought of Marxism, at least in its classical formulation by Laski in the 1930s, as a political alternative. Much of the interest in Laski seeks to separate the early Laski of pluralist parliamentary arguments from the later Laski of Marxism. Laski's appeal rests on subtle aspects of his science of politics that require a detailed examination before their full significance can be understood. 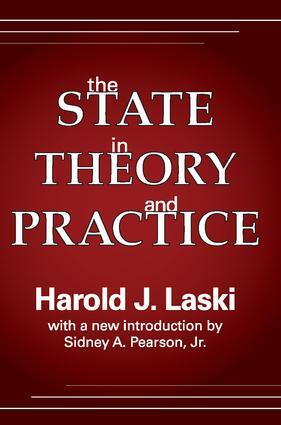 The state is a work that operates at several layers of assumptions and implications.The significance of Laski starts with the observation that among many intellectuals on the left, the political critique of liberal democracy remains as influential after the collapse of the Soviet Union as it was when Laski wrote. The leftist critique of classical liberalism is one of the touchstones of modern political thought and Laski remains part of that tradition. Laski is one of the links between what might be called the ""old left"" of the pre-World War II era and the ""new left"" of the 1960's and later.